Does anyone else get REALLY sick of mashed potatoes? They’re really the only kind of potatoes my kids will eat, so I make them (way) too often. Mashed potatoes really are a lot of work too, so I wanted a different potato to serve, especially for farming meals, so I adapted a loaded potato casserole dish and it’s absolutely delicious! Cut up potatoes, I like about 1″ cube size, and boil them until tender—don’t let them fall apart! As potatoes are cooking, cut up bacon pieces, fry, drain and set aside. You can also preheat your oven to 350ºF and mix the ranch dressing, sour cream, ½ cup of cheddar cheese and parsley together. When potatoes are cooked, drain them, put them back in the pot and add in the ranch mix and bacon and stir well to combine. 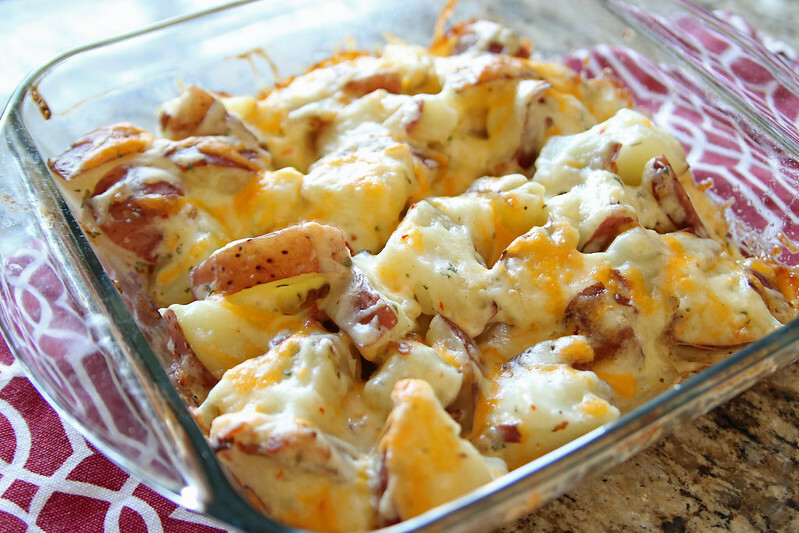 Place potato mixture in a greased 8×8″ (or similar size) casserole dish and cover with the remaining ½ cup of cheese. Bake, uncovered, for about 30 minutes or until cheese is nice and bubbly. Add slices of green onion on top (which I forgot to do before I took the photos—ugh!) and serve! Who else is sick of mashed potatoes? 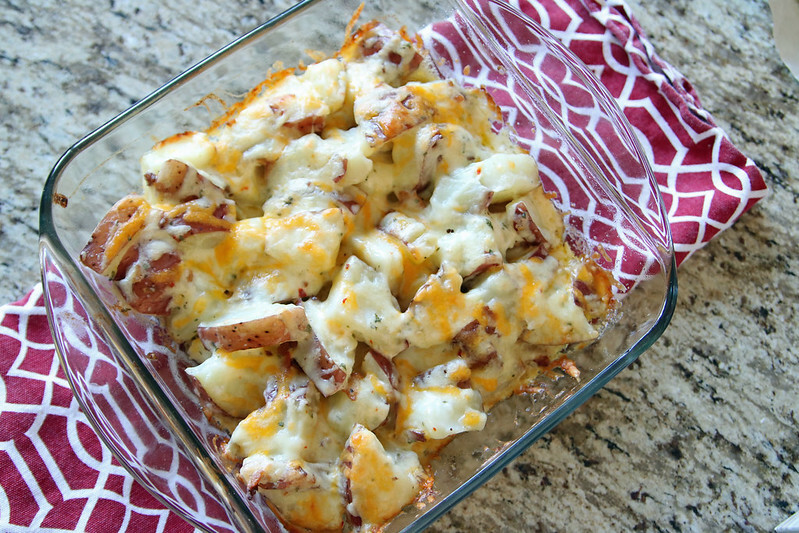 Try this tasted loaded potato casserole instead! Cut up potatoes, I like about 1" cube size, and boil them until tender---don't let them fall apart! As potatoes are cooking, cut up bacon pieces, fry, drain and set aside. Mix the ranch dressing, sour cream, ½ cup of the cheddar cheese, bacon, and parsley together. When potatoes are cooked, drain them, put them back in the pot and add in the ranch mixture and stir well to combine. Place potato mixture in a greased 8x8" (or similar size) casserole dish and top with the remaining ½ cup of cheese. Bake, uncovered, for about 30 minutes or until cheese is nice and bubbly. Add slices of green onion on top and serve. Doubles well for a larger crowd; can prepare ahead of time and keep in fridge until ready to bake. This recipe works well to prepare beforehand, stick in the fridge, throw in the oven just before dinner too! « Ethan is 4.5 Years Old!